Ford has announced both software and hardware interfaces allowing 3rd parties to build advanced high-technology accessories, converting the car into an application development platform. Ford, on Thursday, ushered their open source hardware accessory platform, OpenXC, out of beta. This came on the heels of the announcement on Tuesday of a software application platform for Ford's SYNC AppLink system. The two offer complementary ways in which Ford's vehicles will become platforms for the sale of both software and hardware addons of a completely different type than the traditional car accessories. This is not your LED running lights and faux fur seats, these will be cutting edge high technology integrating miniaturized computer hardware via the OpenXC platform, or smart phones via the SYNC AppLink system. The OpenXC platform was announced nearly a year ago, and at that time Ford said it was in "Beta". 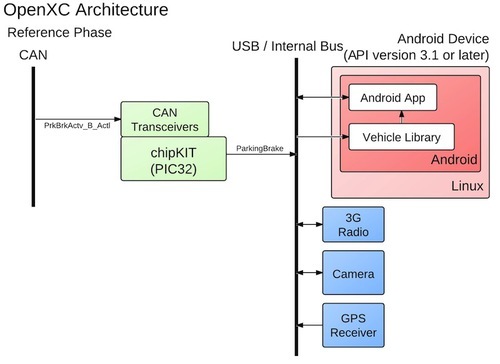 It is an open sourced hardware and software layer providing access to the CANBUS on Ford vehicles via the OBD-II connector. The CANBUS is a digital communications technology used in all modern vehicles that you can think of as a "Local Area Network" (LAN) for your car. Modern car components send information and commands via the CANBUS. If third party accessory makers could access that information they could integrate hardware with cars to add functionality. There is a lively subculture of people using scantools that connect to the car via the OBD-II port to tweak engine settings, sometimes for higher performance, other times for higher efficiency. On Tuesday, Ford announced a software-only interface into the SYNC AppLink portion of Ford's infotainment system. While both interfaces treat the automobile as an application development platform, the two are very different in details. The SYNC AppLink interface is solely to integrate voice control of smart phone applications into the voice controlled SYNC system in their cars. It is ready right now for smart phone application vendors to deploy for production productized use. On the other hand, OpenXC as a leading edge research project where it's not clear what can be done with the data available through the OpenXC interface. Instead, Ford is encouraging developers, researchers and hackers to focus on using big data and open-source innovations using OpenXC. Note, in this case Ford is clearly not encouraging the criminal sort of "hacker" to participate, but is referring to the traditional sort of hacker whose love of technology lead them to tinker, take things apart, and rebuild them in interesting ways. The OpenXC kit includes an Arduino-based vehicle interface module. Arduino is an open source computer design that is popular among the hardware gizmo hacker community. It can be built into microminiaturized modules, that could easily be tucked behind the dashboard, and be programmed to do amazing things. The OpenXC interface provides real-time access to parameters like the vehicle sensors, GPS receiver and vehicle speed. The user display could be an application running on a smart phone or tablet computer. It is a read-only designed to keep everything isolated from the vehicle control systems, meaning that the OpenXC interface cannot write data into the car, it can only read data from the car. Ford hopes researchers and hackers will target three areas of important buzz words: Big Data is the processing of large amounts of data to tease out meaningful information. Ford sees this as potentially producing a more personalized, convenient and productive driving experience. Open-source innovation views the car as a platform and providing access to real-time data allows for the rapid development of custom hardware and software applications. User experience can be improved by "connectivity" either to the Internet or neighboring vehicles on the road. This is an increasingly important part of the total user experience while driving. Finding new ways to reduce stress and keep the driver informed can make driving a more pleasant experience. “Through the OpenXC platform, we are paving the way for new opportunities that will help us prepare for the future of transportation where the automobile, mobile networks and the Internet cloud come together in ways never before imagined,” said Venkatesh Prasad, senior technical leader of Open Innovation for Ford Research and Innovation. Semi-intelligent people don't read Torque News. They watch TV and snort Budweiser. I recognize what you're saying and appreciate the input. I personally have looked at and experienced personally every angle of the word "Hacker" including its role as a family name dating back hundreds of years. "Hacking" has a long history of dual meanings. One meaning is the criminal meaning you're referring to. The other meaning is those whose love for technology leads them to take things apart, put them together, play with the technology, and create amazing things. The negative version of "Hacker" came from some irresponsible journalistic coverage of an earlier era of technology. The press release issued by Ford explicitly used the word "Hackers".